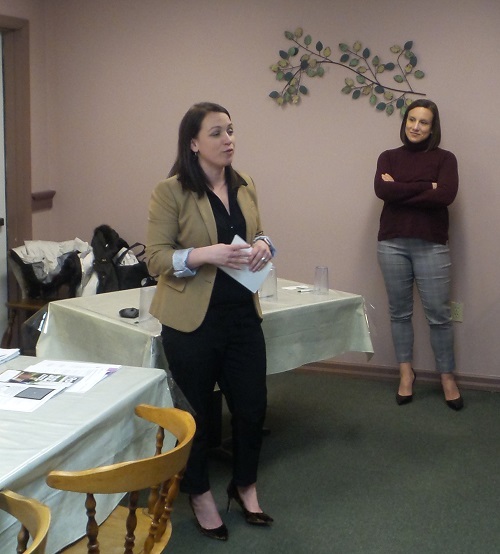 Sara Peperno and Amy Feldman from Northeast Sight gave a presentation at the Feb 28 Rotary Luncheon on their services for the blind and visually impaired in Wyoming County. Northeast Sight serves people with a myriad of different vision issues. Vision issues are one of the top ten disabilities throughout the world. Vision issues will double in the next decades as our population ages. Sara and Amy then set up an activity re vision issues with 5 participants, who were each given glasses/blindfold that would simulate a different visual impairment. They were asked to text a friend that they were at our meeting, pay $1.12 for a glass of water, pour a glass of water and then return to their seats with glass/blindfold on asking for assistance if necessary. Our brave volunteers were Terri Detrick (cataracts), Chelsea English (glaucoma), Gina Suydam (macular degeneration), exchange student John (diabetic retinopathy) and Jon Buxton (total blindness). Jon needed assistance to get back to his seat with a blindfold on. 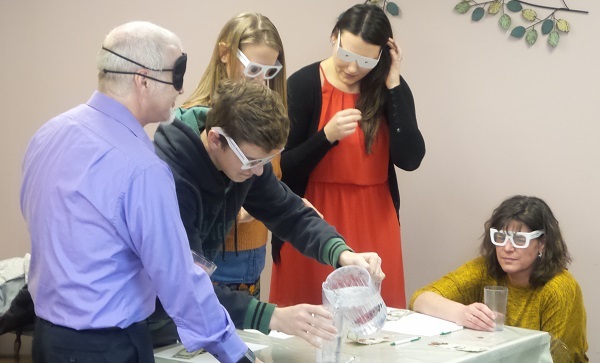 Each volunteered described what it was like with their glasses on and Sara explained how vision impaired individuals can perform the tasks that they were asked to do.